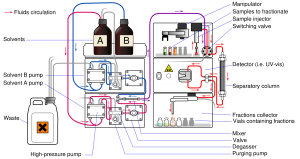 High performance liquid chromatography or commonly known as HPLC is an analytical technique used to separate, identify or quantify each component in a mixture. The mixture is separated using the basic principle of column chromatography and then identified and quantified by spectroscopy. A computer analyzes the data show the output in display. HPLC works following the basic principle of thin layer chromatography or column chromatography, where it has a stationary phase ( solid like silica gel) and a mobile phase (liquid or gas). The mobile phase flows through the stationary phase and carries the components of the mixture with it. Different components travel at different rates. Thus the components separated and found in different region in chromatography to separate, identify and quantify. The solvent reservoir store the solvent or mobile phase to supply to the column as necessary. The solvent is pumped to the column in a specific flow rate. After placing the sample in the sample reservoir the injection process is fully automated. The injector injects the sample into the continuously flowing mobile phase stream that carries the sample to the HPLC column. the composition of the solvent. There are several methods of detecting when the component is passed out of the column. One of the method is by UV light. Many compounds absorbs UV lights of various wavelengths. UV light is shinned where the component passed out from the column. This light passed through the component and absorbed by it. On other end there is a detector to identify what is missing in the UV lights. The amount of UV absorbed depends on the amount of component passing out of the column. The display will be recorded as a series of peaks- each one represents the each component in the mixture which can absorb UV light. The area of the peak is proportional to the amount of the component passed through the detector. The area of the peak is automatically detected by the computer. The computer also detect the retention time of that specific component. If the solution is diluted the area of the peak will be less, while the detention time will be same. Thus it is possible to detect a substance present even in a very small quantity. HPLC is an analytical technique used to separate, identify or quantify each component in a mixture. HPLC works following the basic principle of thin layer chromatography or column chromatography, where it has a stationary phase and a mobile phase. The mobile phase flows through the stationary phase and carries the components of the mixture with it. There are five sections in HPLC- reservoir, pump, column, detector and computer.